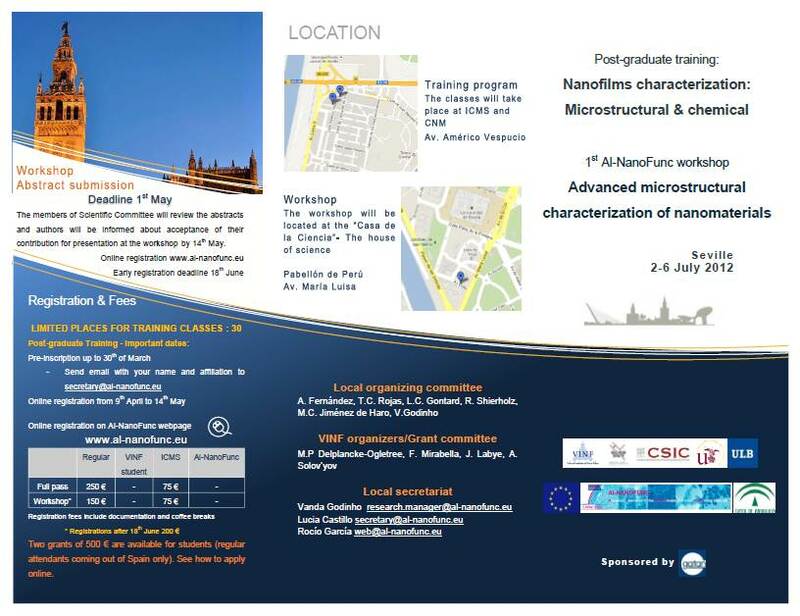 We are pleased to announce the Post-graduate training co-organized with VINF and the 1st Al‑Nanofunc workshop. Within the field of nanotechnologies, VINF (www.vinf.eu) activities focus specifically on nanostructured thin films. Starting in 2009, VINF launched a two-year training program with advanced lectures and seminars related to Nanofilms Science and Technology. The program is dedicated to students (PhDs), young scientists (post-docs) and personnel working in industries. The program is based on various modules. 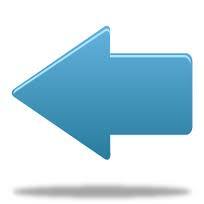 Attendants can follow any module and the certificates will be independent for each module. This 3 day training will be composed of two parts. A basic approach on general characterization techniques such as X-Ray diffraction, X-Ray Photoelectron Spectroscopy, Atomic Force Microscopy and Scanning Electron Microscopy and the main part dedicated to Advanced Transmission Electron Microscopy Techniques. 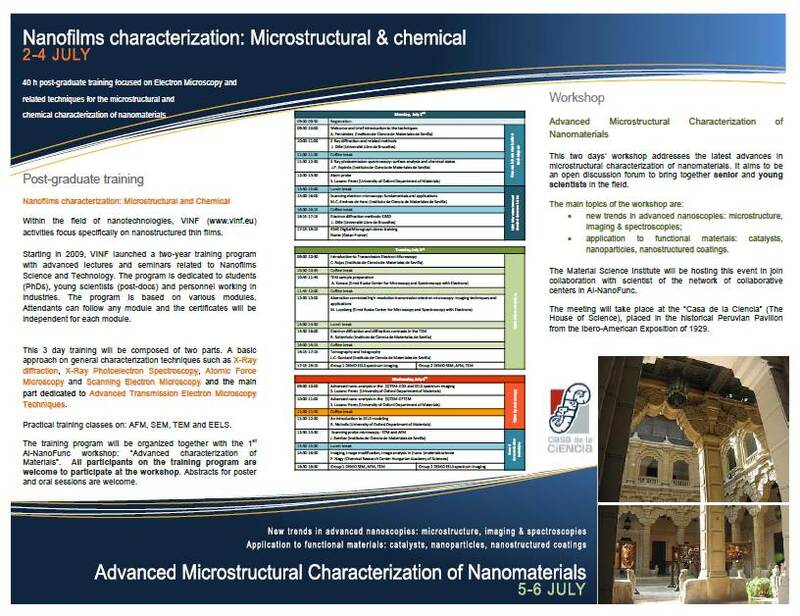 The training program will be organized together with the 1st Al‑NanoFunc workshop: “Advanced characterization of Materials”. All participants on the training program are welcome to participate at the workshop. Abstracts for poster and oral sessions are welcome. 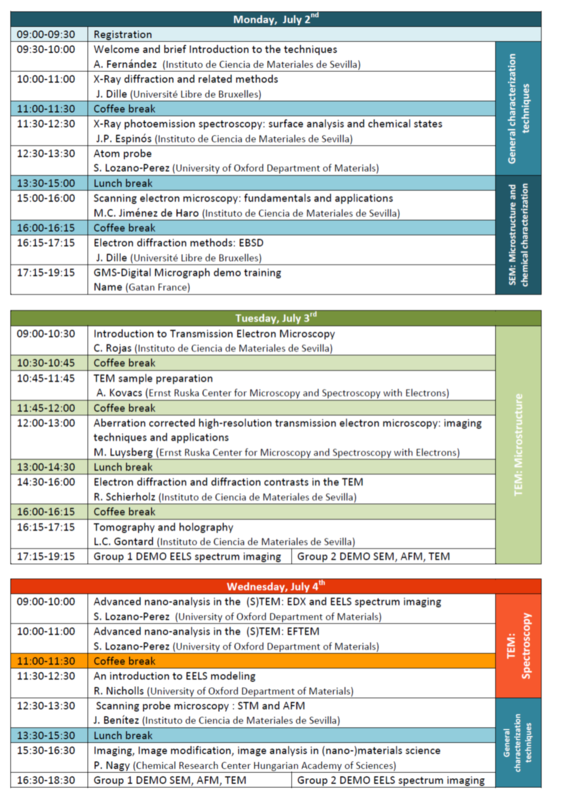 This two days’ workshop addresses the latest advances in microstructural characterization of nanomaterials. It aims to be an open discussion forum to bring together senior and young scientists in the field. application to functional materials: catalysts, nanoparticles, nanostructured coatings. The Material Science Institute will be hosting this event in join collaboration with scientist of the network of collaborative centers in Al-NanoFunc. 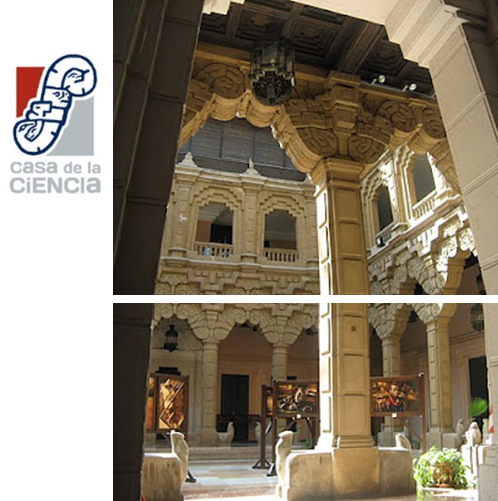 The meetin g will take place at the “Casa de la Ciencia” (The House of Science), placed in the historical Peruvian Pavilion from the Ibero-American Exposition of 1929.